Granite worktops are a natural choice when it comes to kitchen installations. However, they are also a great means of enhancing other work areas such as those found in large bathrooms or utility rooms. There is a wide range of colours available for granite worktops. However, because the stone is entirely natural, it is unlikely to retain the uniformity that you may find in less natural surfaces or artificial stone surfaces. There may be slight colour changes in the stone or stippling effects on the surface. Such blemishes are likely to be purely aesthetic – they won’t affect the surface of your worktop. Granite worktops will be certified by relevant bodies to ensure that their quality is high. Kitchen worktops of various kinds can be found in other kinds of stone and material. Stone worktops comprising certain manmade elements may have a certain density or flexibility that less natural surfaces won’t have. There are natural stone aggregates – such as quartz – that can be mixed with polymers for cohesion, strength and flexibility, and pigments for colour and aesthetics – to produce kitchen worktops. However, when it comes to the look of your kitchen worktop, nothing will appear as natural as granite – because it is entirely natural. Only marble – itself another natural stone – will match granite in terms of aesthetics – and while marble has a similar look, it does not have the same strength as granite has. Granite worktops offer a timeless elegance to a kitchen – or any other room. The stone granite has been employed in architecture and house building – as well as in other forms such as art, tool making and sculpture – for thousands of years. Later, materials such as plastic and stainless steel became popular for kitchen surfaces and other work areas. Solid surface man made materials like plastic have the flexibility to incorporate sinks into the worktop. Other kinds of material, such as glass, can be formed to do the same function. A granite worktop also has a certain element of flexibility. The stone mason can file or sand down the surface to give it a smoothness at its edges. It can be fitted into joints in much the same way that other kitchen worktops are fitted. 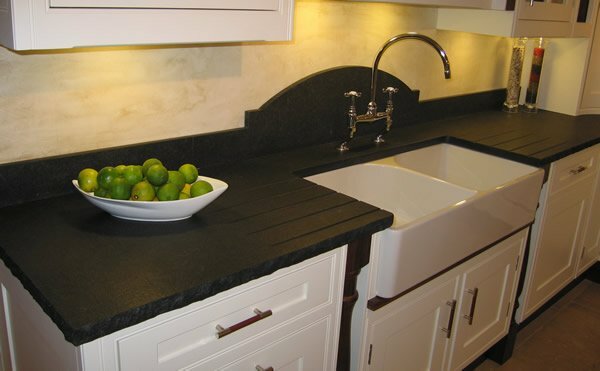 An entire sink may not be hewn out of granite, but a granite worktop adds a touch of class that other surfaces lack. Granite worktops have various advantages over their manmade counterparts. Plastics will expand or contract when faced with extremes in temperature to a greater degree than granite will. Tiled surfaces use grouting, which can collect dirt and germs of various kinds over the course of days, weeks or years. Granite’s smoothness makes it far easier to wipe down. The ease with which granite worktops are cleaned is surprising, and it is not a difficult surface to maintain. It is recommended that a damp cloth can be used to wipe down a granite surface. You should avoid the use of bleaches and other kinds of cleaner. You can source cleaners that are specifically used on stone worktops.